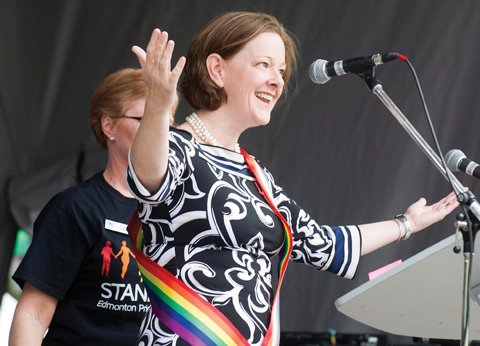 Alison Redford appeals to a broader base. The punchline drew some applause. Redford drew a better response with her pledge to ensure people get to live their lives with dignity and confidence, and as who they are. Near the stage a teenager in a purple wig clapped politely. The leather-clad woman next to her shouted her approval, as did the clutch of guys in skinny jeans. Redford came offstage to talk with reporters, telling us her attendance shouldn’t really be much of a story in modern Alberta—she had taken part in the 2011 pride march as a Tory leadership candidate. Booth considered voting Tory last spring, but decided against it. A bout of never-thought-I’d-vote-PC clearly afflicted many Albertans, however. The NDP, Liberals and other parties on that side of the political fence got 35 per cent of the popular vote in Alberta’s 2008 election, but only 20 per cent in April 2012. It used to be that the Grits, NDs and Greens catered to the environmentalists, human rights advocates, academics, artists, unions, social workers, teachers, nurses and others who felt disenfranchised or shortchanged. The mighty PC tent gathered in pretty much everyone else. But Alberta’s current premier—speaker of French, reverser of cuts, raiser of disability benefits—is competing for many interests often overlooked by the 42-year governing party. Meanwhile, a host of other groups are scurrying out the tent’s right flap, and it’s unclear whether they will return. Or whether Redford cares one whit. A new measure adding $271-million to the budget last spring? Yep, election season was upon us. Albertans have come to expect these big-ticket goodies as printers get orders for campaign signs and bus decals. Civic officials awaiting a new hospital in Medicine Hat or a college expansion in Grande Prairie get their hopes up extra high once newspapers began to speculate daily on the timing of an election call. But in Redford’s first turn at the tax-and-spend levers, that multi-million-dollar bump in a deficit-mired budget wasn’t the typical one that would get construction-contractor tongues wagging. The $271-million measure hiked Assured Income for the Severely Handicapped payments by $400 a month and let clients earn more income before government clawbacks would kick in. But this was also the fulfilment of a campaign promise. During the previous summer’s Tory leadership race, Redford had insisted she was “troubled by the fact there is a group of people that are truly vulnerable and very much want to live their lives with dignity and confidence,” and pledged to raise the level of government support. The last time AISH had come up around an election was 2004. Ralph Klein had griped about two women who “didn’t look disabled” “yipping” at him about payments. In just her first budget, Redford had hiked benefits more than they’d been raised in the last 20 budget years combined. Redford, veering from her prepared text, surprised the crowd of not-for-profit leaders. They hadn’t expected to hear their own advocates’ language echoed back to them by a premier, even if she had been cultivating their support during her campaigns. “But if I were her, I’d be afraid, because we all now have very high expectations,” Theatre Alberta’s Keri Mitchell told the Edmonton Journal. 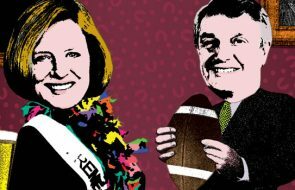 Months later Redford would tap Karen Lynch, long-time executive director of Volunteer Alberta, to a communications post in the premier’s office. A litany of opposition complaints left over from the Klein years still exists. School fees? Still there. Saving for the future instead of squandering oil wealth? The Lougheedian dream still eludes us. Doctor intimidation and ER wait times? Concern is high from nearly all corners, and the worry is festering. Even AISH payments aren’t indexed to grow with inflation, while MLA salaries are. A traditional Tory partner hasn’t gone anywhere: the oilpatch. Redford’s pledge of “responsible development” hasn’t triggered a change in the pace of oil and gas extraction. Redford was executives’ point person in Calgary during the Stelmach days, and as premier has boosted bitumen pipelines and reassured industry that she won’t raise oil and gas royalties. A cold political calculus may account for the PC brand’s new incarnation in this, its fifth decade of rule. A rural-based threat rose in southern Alberta during Stelmach’s latter years as premier, flaying the Tories from the right and determinedly branding themselves as “true conservatives,” with Danielle Smith putting a young and charismatic face on a gang stereotyped as grumpy old men. Meanwhile, the Liberals had weak organization after their own leadership shuffle, the NDP was stalwart but had slim hope outside of a few Edmonton ridings, and the Alberta Party were an untested social-media phenomenon led by a little-known fellow from Hinton. However crowded, the thinking went, the centre-left offered room to grow for the Tories. But this armchair analysis overlooks who Alison Redford is and where she comes from. Even if the political climate hadn’t been so ripe for a PC shift to the centre when Redford became the latest come-from-behind darling, Redford may have wanted the same shift. Given almost any opportunity, Redford will declare the late Mr. Lougheed her mentor, and will add that his is the legacy she carries forward. She’ll say far less about the party’s other dynastic ruler, Klein, or about Don Getty—she had little to do with the Alberta PCs when those men were running the show. Redford was six years old when Lougheed became premier in 1971. She became president of the party’s youth wing while still in high school. After Lougheed resigned, she worked on the leadership campaign of former MLA Ron Ghitter, an outspoken progressive who would keep a distance from the party after Getty won, arguing that the new premier had vacated the political centre. Following Ghitter’s third-place finish, Redford headed off to law school in Saskatchewan and then worked in the Mulroney government in Ottawa, in what was the start of a 23-year hiatus from any significant role in Alberta politics. 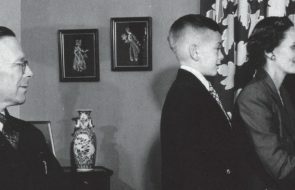 As Calgary’s political establishment tilted toward Preston Manning’s Reform Party, Redford remained close and worked with the dwindling Red Tory team: Lee Richardson, Joe Clark, Jim Prentice (whose law firm she articled with) and organizers Stephen Carter and Susan Elliott, who would become her top campaign strategists. Asked in an interview about Lougheed’s comparison of Klein to the Socreds, Redford gave the PC (as in “politically correct”) answer about respecting that Klein made “tough decisions” and erased Alberta’s fiscal debt, but added it’s important for Alberta “not to fall backward.” It’s Smith who talks most and most wistfully of Klein’s “Alberta Advantage” brand. Redford remained a provincial PC member throughout the 1990s and 2000s, but her first choice for seeking office was federal—she gravitated to her “natural connection,” she explained. In 2004 she unsuccessfully challenged MP Rob Anders for the Calgary-West nomination for the newly merged Conservative party. Redford sat out the next provincial election that same fall, as well as a subsequent by-election in Calgary-Elbow after Ed Stelmach became premier, but then ran and won in Elbow (Klein’s old riding) in the 2008 general election. After leaving cabinet in 2011 to pursue the leadership, Redford would lay bare some of her disagreements with the Stelmach regime—for example, over AISH and gender-reassignment surgery. Many party members accused her of Tory-bashing on her way to the party’s leadership, a first-term rookie challenging party stalwarts Gary Mar and Doug Horner. “I thought she needed more grooming,” says former transportation minister Luke Ouellette. Redford’s critics, both inside the party and out, pointed to her having but one fellow MLA endorse her for leader (Art Johnston) as proof she couldn’t bring the team along with her. Aside from Snelgrove—a Stelmach loyalist—no MLAs bolted the party. But many chose not to run again. For a premier trying to turn the page, that likely worked to her benefit. Thanks in part to voters’ purge of rural southern Alberta PCs, freshmen and sophomore members now dominate Tory benches. The 19 MLAs who’ve been thumping legislature desks longer than their boss now form a caucus rump. Those “veterans”—having served three terms or more—are outnumbered by the 23 PC rookies elected last spring, who know no team but Team Redford. Redford cites Brian Mulroney as another leadership role model. She admires how he managed a large caucus and executed controversial policies, including free trade and the GST, but also his belief his MPs should all “sing from the same hymn book.” The premier has also selected office staff with little connection to past provincial governments. Her chiefs of staff, Stephen Carter (pre-election period) and Farouk Adatia (post-election), haven’t worked in the legislature before, while policy chief Darren Cunningham and principal secretary Lee Richardson have more ties to Mulroney than to recent Alberta leaders. Sometimes it’s remarkable to realize what amounts to the historic and revolutionary in Redford’s actions. For instance, she was the first Alberta premier to name a transportation minister who represented a big-city riding—for more than a century, they’d all been from areas that cared more about widening highways than funding public transit. Dubyk and Redford now hug whenever they see each other—a common practice, others say, of Redford’s. MADD is now a group well ensconced under the Redford Tory tent. And as with the gay community and others who had grown used to indifference or worse from the Alberta government, the group is hearing their messaging emphatically echoed back to them by a premier trying to reshape the public discourse. It’s healthy to be wary of new political leaders offering hope. (See Obama, B.) Redford has come in with several flourishes of accountability and transparency, such as public-sector whistleblower legislation and mandating the return of MLAs’ “no-meet committee” pay, fuller expense disclosures and a public inquiry (albeit limited) into hospital queue-jumping—Alberta’s first judicial inquiry since the Code Inquiry into the Principal Group back in the Getty days. But nearly every political leader enters with one broom and gets swept out by another. Stelmach came in with “Honesty, Integrity” as his campaign slogan and gave Alberta its lobbyist registry and better access to flight records on government planes. Klein brought in the first ethics commissioner and quasi-public policy committees and also cracked down on questionable MLA pay packages. Stephen Harper, whom few would call Mr. Openness today, started as prime minister by introducing the Federal Accountability Act and appointed the first parliamentary budget officer. Often, initial gestures get lost in a muddle of so much of what follows the honeymoon period. 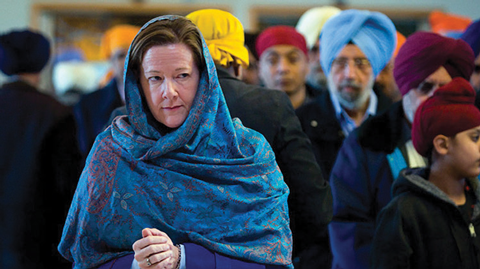 Redford’s impulse toward being inclusive will be tested on budget matters. If energy revenue continues to sputter, she will have to disappoint people she’d rather please, or try countering such ingrained Tory habits as balanced-budget legislation and public disdain for debt (although she’s OK with borrowing to build stuff). Jim Dinning, another former Lougheed acolyte, became public-service hatchet man as treasurer in the 1990s when times—and his boss, Ralph—demanded. Redford has ruled out one decidedly unconservative solution, repeatedly promising not to hike taxes. She has positioned herself as a “no looking back” premier pursuing new directions and listening to new audiences. But if debate refocuses around old matters of dollars and cents, the traditional battle lines Redford would rather rub out could get redrawn pretty quickly—by those with her as well as those against her. Jason Markusoff is the civic affairs writer for the Calgary Herald and a former legislative correspondent for the Edmonton Journal.